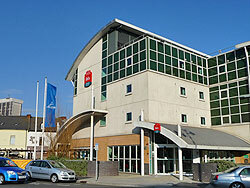 The Ibis hotel is conveniently located in Cardiff city centre, right alongside the Cardiff International Arena. The hotel has a total of 102 guest rooms with prices starting from as low as £49 per night. There is a hotel restaurant and bar but if you can manage the 30 second walk across the road to the Thai House you can feast on the finest Thai food in Cardiff. Conveniently located in the city centre - next to the Cardiff CIA. 10 minute walk from Central Train/Bus Station. Discounted public pay parking nearby. Hotel bar, restaurant and 24 hour snack service.